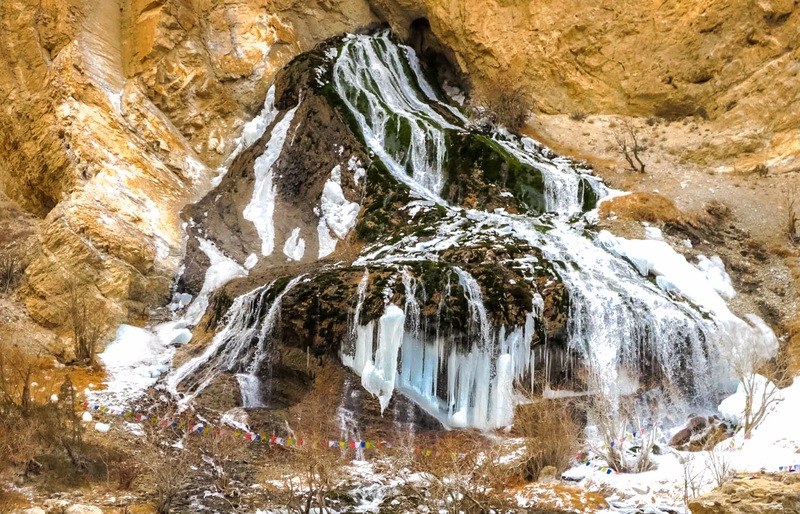 Chadar, the frozen Zanksar river trek is one of the toughest and most adventurous experience. 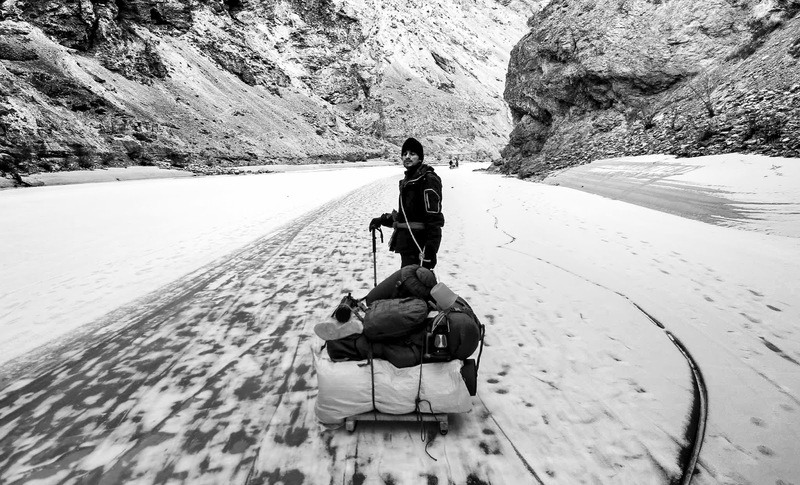 Rakesh connected me to 4 folks in his office who did this trek in January this year (jan'14). Today I had a quick telephonic chat with Pramod who shared his experience about the trek in 5 minutes. I have tried to share this blog post on behalf of Pramod. 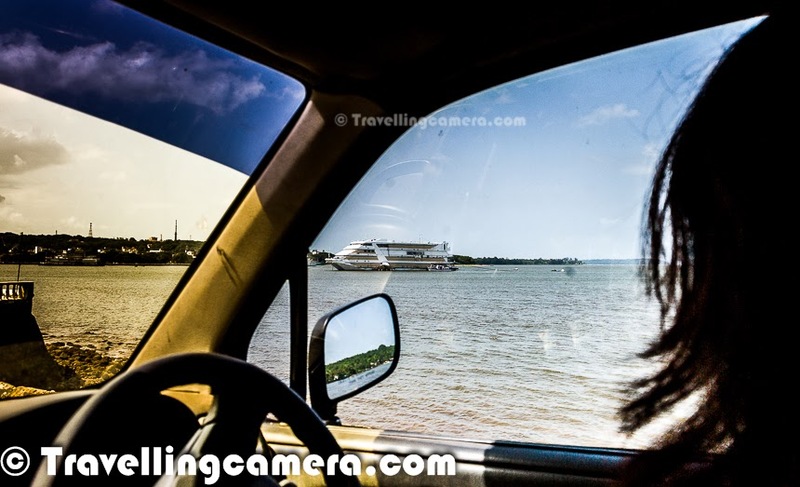 Thanks Pramod for your valuable time and sharing the experience with PHOTO JOURNEY viewers. 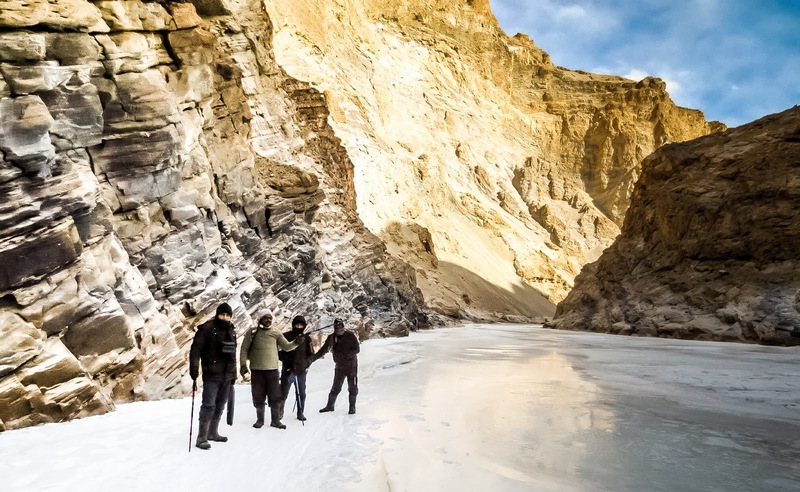 Planning for this trek had already happened in the month of June last year, when these four chaps had booked their flight tickets to Leh. After ticket bookings, the preparations for Zanksar trek started. 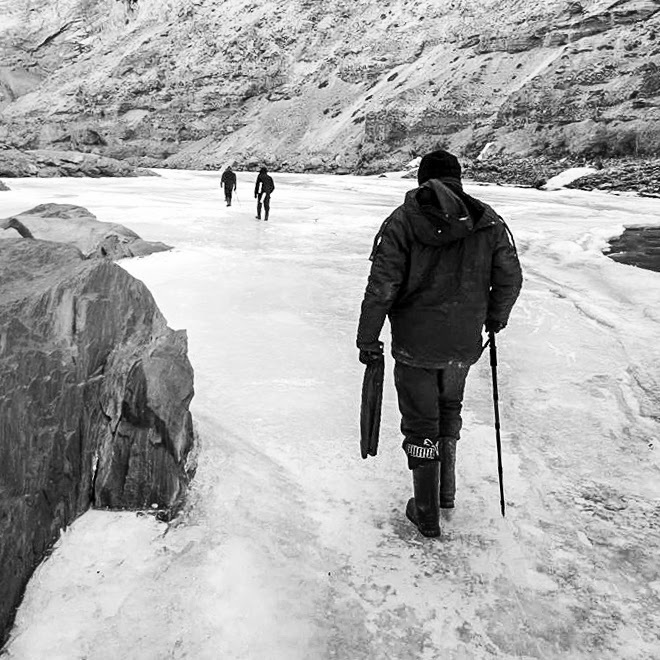 They already knew that it's going to be chilling cold on the frozen river and they need to have right stuff with them to survive this trek which is considered as 17-18 days long trek in Himalayas. Preparations for this trek included - buying right set of cloths, shoes, a stick, warmers, a good jacket, appropriate things to eat and keeping in mind that luggage weight needs to be minimal without compromising on the stuff required. During these months, they researched about various places to buy trekking equipments including tents and all. Finally they landed at Sadar Market in Delhi to buy all this stuff. On 17th Jan, they took GoAir flight to Leh and landed in chilling himalayas with -11 degree temperature. After landing on Leh Airport, Pramod and gang had a quick hunt for place to stay and relax. Jan is the time when Leh is almost empty and some of the hotels were under renovation. Finally they landed to a guest house with decent space for everyone. Food was good and it was near to the market from where more stuff for the trek was bought. Hotels are available at reasonable rates during winters. After some shopping at Leh Market and taking rest, everyone started for the trek. Shopping list included - frozen chicken, stove, kerosine oil, rum and some snacks. Two of the folks were not feeling well after landing in Leh. So this made us think about keeping appropriate medicines. 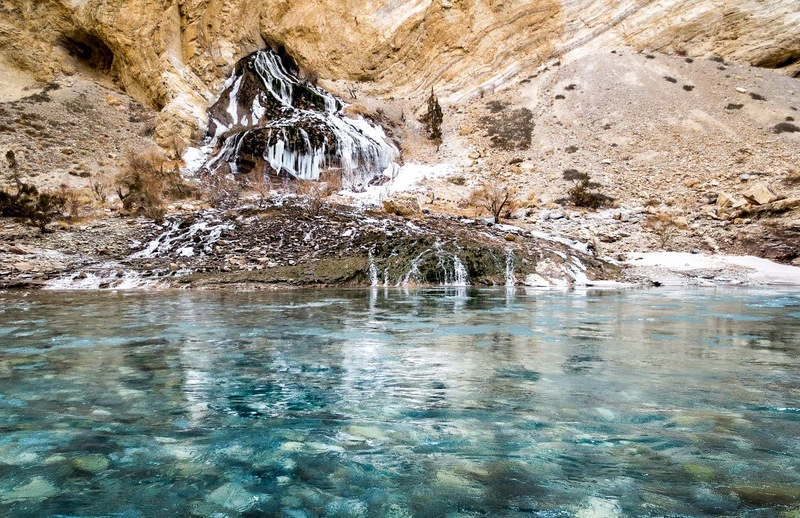 Zanksar River trek is approximately 105 Km long on one side. It's recommended to cover 15 to 17 kilometers in a day. One should not exert and this group was not intending to reach the destination. They wanted to enjoy the trek in 10 days in best way. Usually temperature remains -20 to -15 during the day time and – 35 to –25 during the night. 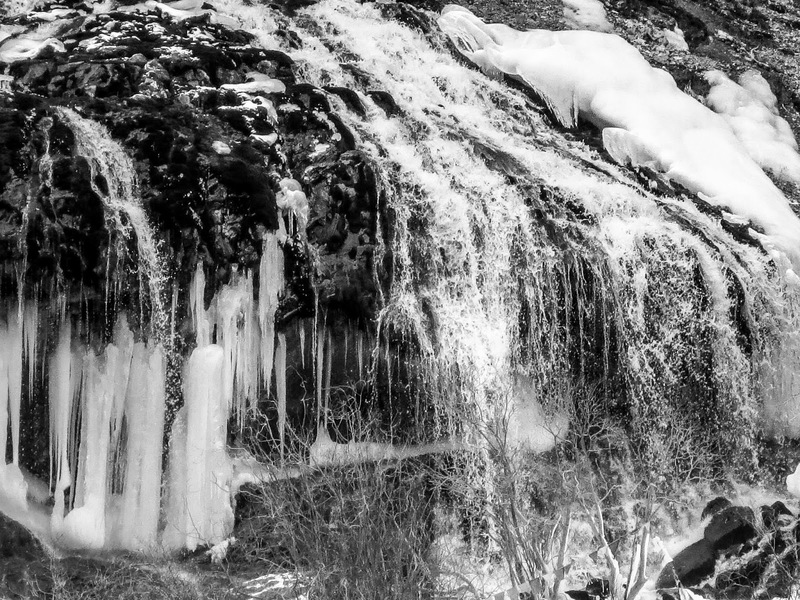 It's highly recommended to keep your warmest Jackets, sleeping bags and good shoe. At the same time, ensure that you don't carry lot of stuff, because more weight during the trek is worst thing to handle. 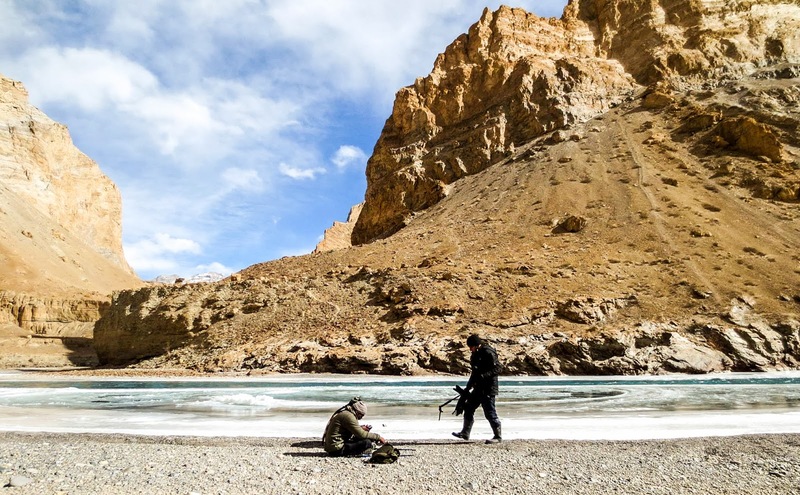 Most of the trek is done on the ice (Chaddar - layer of ice) but at some places one needs to climb icy rocks or trails around Zanskar. Folks thinking joining this unique adventure must be fully prepared to accept tough camping and walking conditions. Most of the nights will be spending in the caves and or tents. From Leh to Chilling, a cab can be booked for 2000 Rs and it's a distance of 75 Kilometer. At times, buses can also be found to reach the base of Zanksar trek. Buses usually charge 150 rs. While coming back to Leh, you can definitely find cabs on sharing basis, which costs around 200 per person. 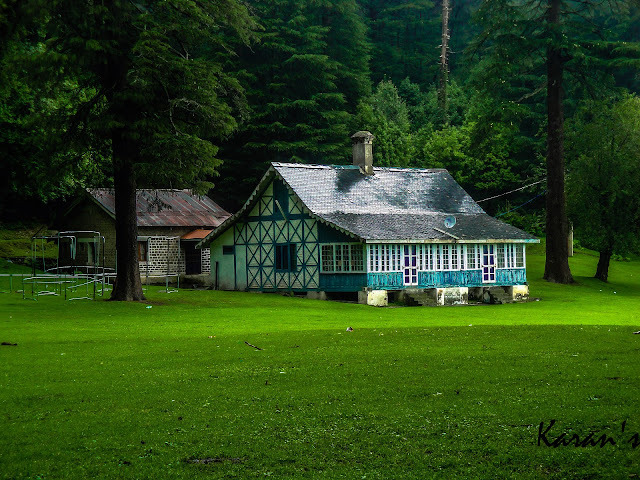 First camp was at Tilad. 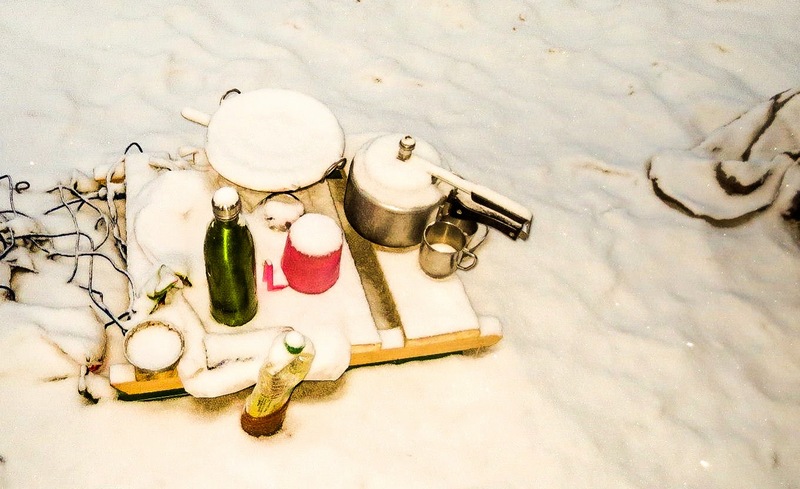 On first day we cooked chicken and had fun around white layer of snow all around. Usually trekking companies provide maggie or khichdi on the treks and Pramod was happy about the fact that they managed food on their own. The porters and the kitchen team will be totally Zanskaris, dedicated and who are perfect to work in any weather conditions. There will be three porters after every tourist and food served will be mostly Indian and Ladakhi. Usually trekkers hire 2 potters because on an average one trekker carries luggage with wt more than 20 Kg and one potter can carry only 12-15 kgs. This is because of the fact that potters also need to carry their own stuff including food for themselves. 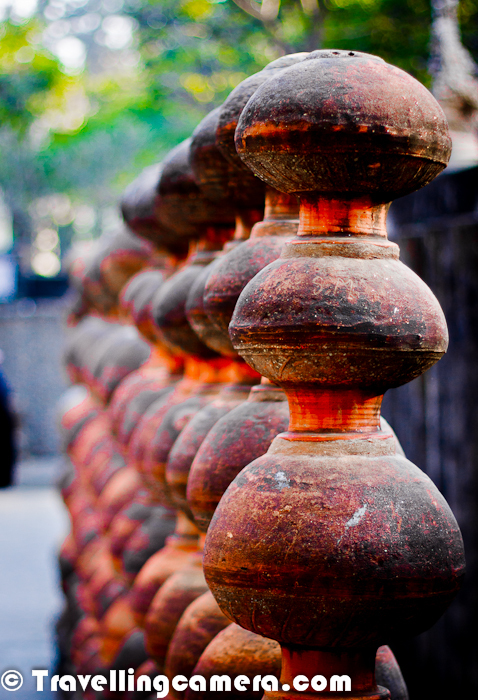 One can hire a potter at 500-700 Rs per day. Parmod and his friends were carrying their own stuff and had hired a local guide because finding right path is very important on this trek. Even, at times, these guides get confused because of snowfall. Especially difficulties increase during fresh snowfall. 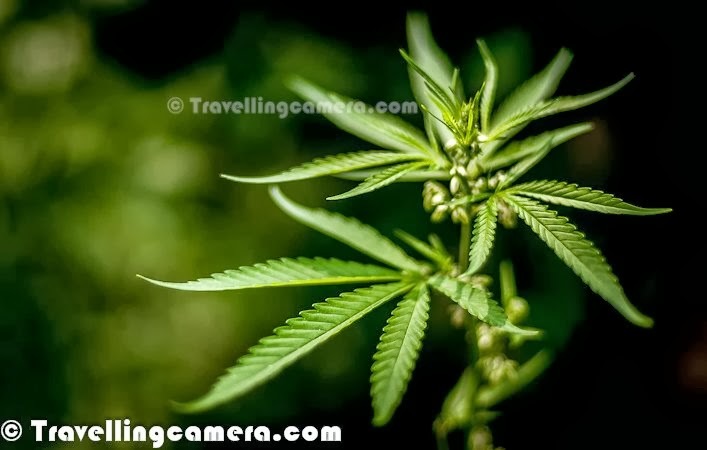 This whole trek is very well managed by potter network, as you get all the details about next terrain in time and all this communication happens through potters on the way and most of the times predictions done by these potters are right. Hill climbing on the way with luggage on the back was tough task and these were the moments when Pramod thought of hiring potter but it was not possible in the middle of this trek. Finding trek was one of the most difficult. Snowfall makes thing more unpredictable. Every step was very risky and had to check patiently. It was difficult to say that next step is going into soft snow or hard ice. Everyday one needed to get up at around 6am and leave the camps by 8am. Shilang & koma were two interesting camping sites. During the trek, Pramod and frns met Tony, who is regular trekker at Zanksar River. he has been visiting this place since 1980. 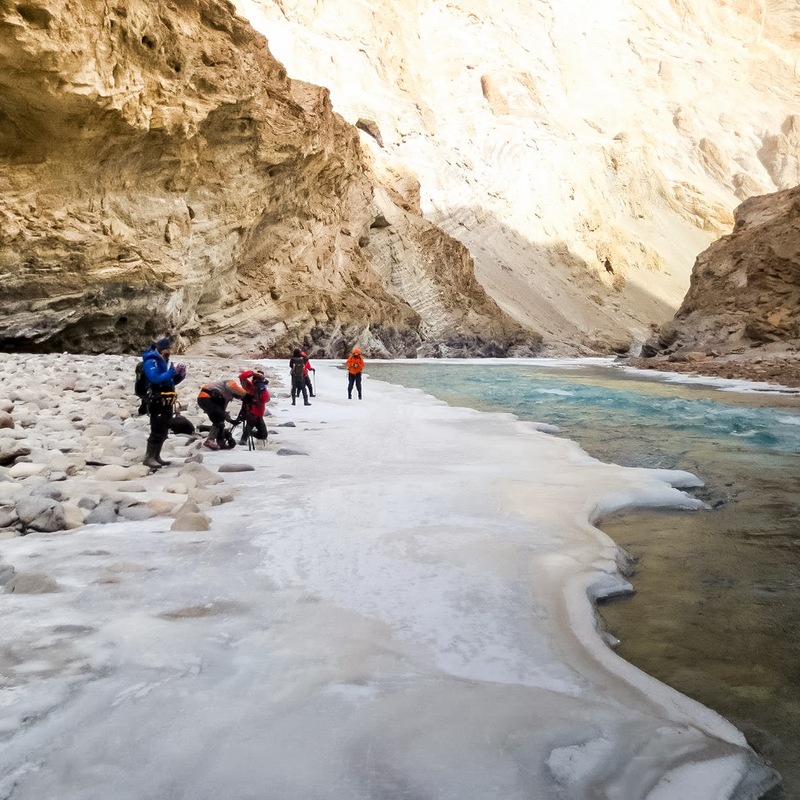 As per Tony, Indians have started coming to Zanksar River trek for last few years otherwise this trek was popular among foreign trekkers. Tony had come to the trek with a group of 8-10 trekkers. 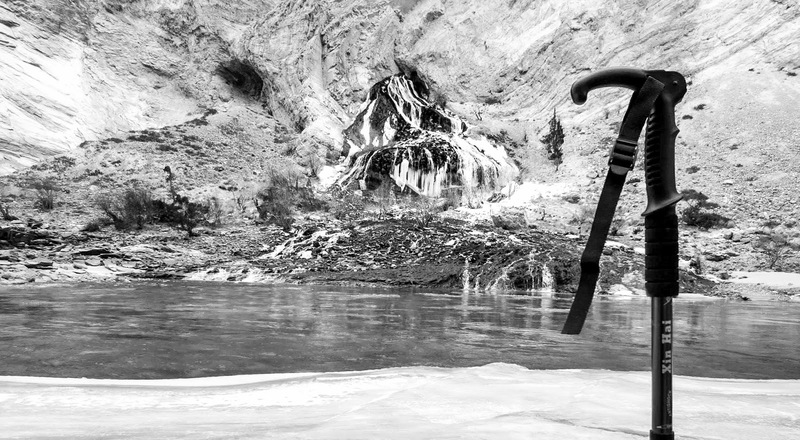 Almost every potter knew him, as he is one of the main trekker who brings other passionate trekkers to the frozen river at Zanksar. 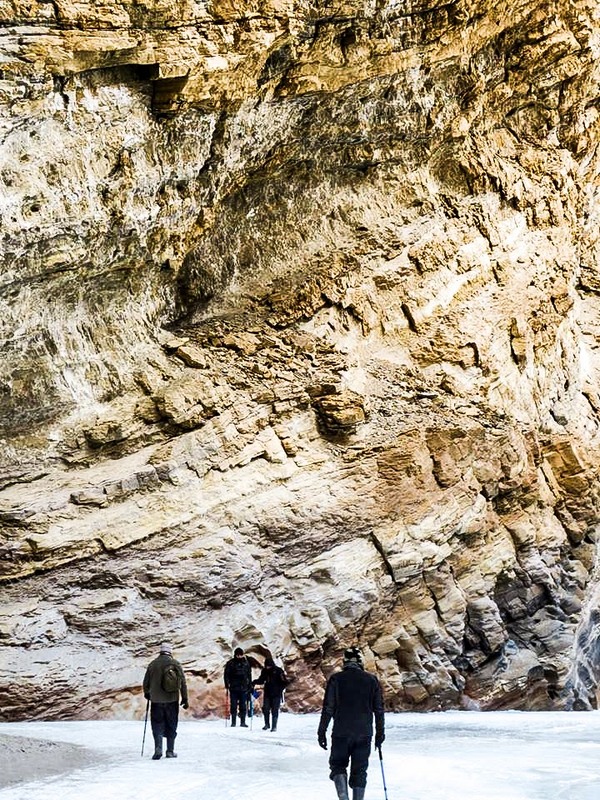 He, along with his group, was staying in caves on the way. Caves are considered good places to camp in night but one needs to be aware of all those caves on this trek. Excitement level was very high. It was unbelievable and at times we felt like in other world. 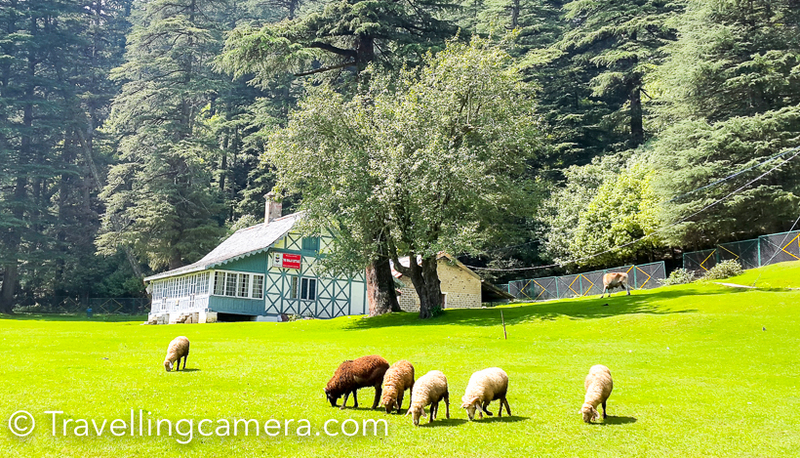 During the trek, many times we thought that going back to Delhi may be very difficult. This experience is very difficult, in fact impossible to describe in words. 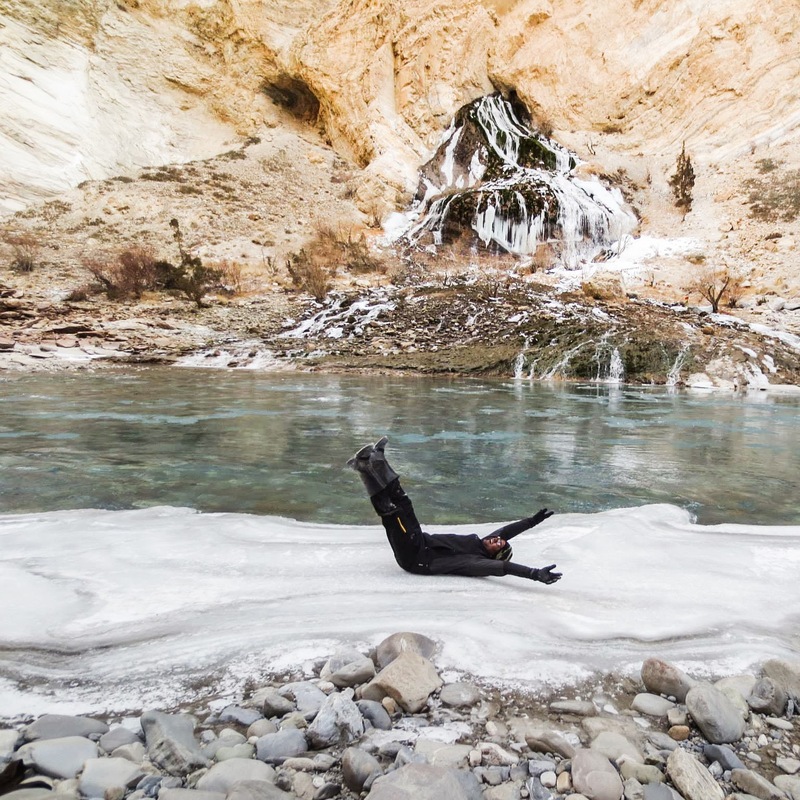 .. Have 4-5 Layers of cloths, including heavy jacket..
Lower sections of the gorge are popular in summer among tourists making rafting trips, typically from Chiling to Nimmu. 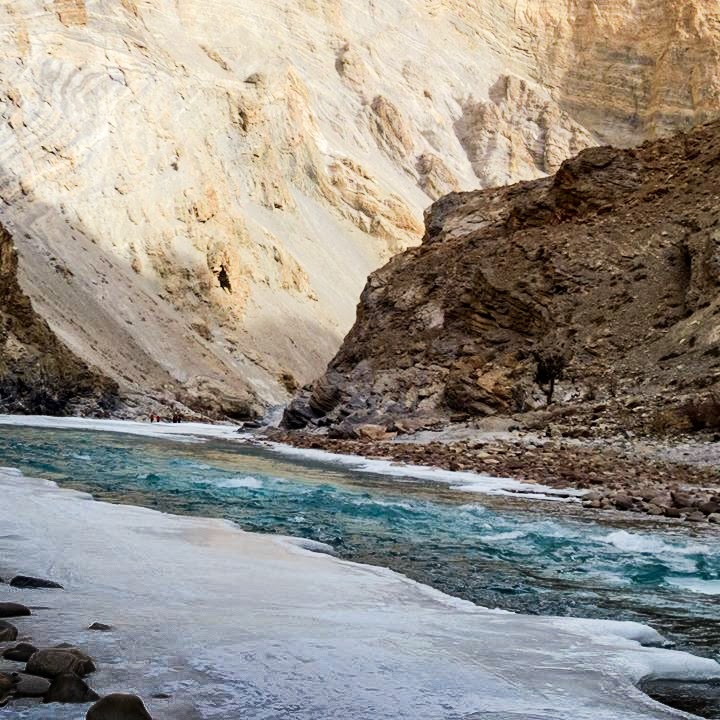 Zanskar River is very popular during different seasons. 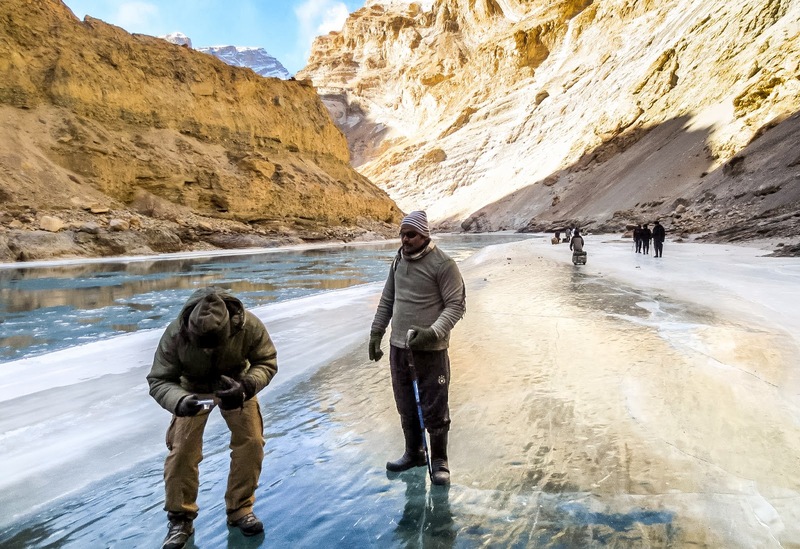 In winters when the roads to Zanskar are closed by snowfall, the only overland route to Padum is by walking along the frozen river, a multi-day hike that is now sold as an adventure activity called the Chadar Trek. 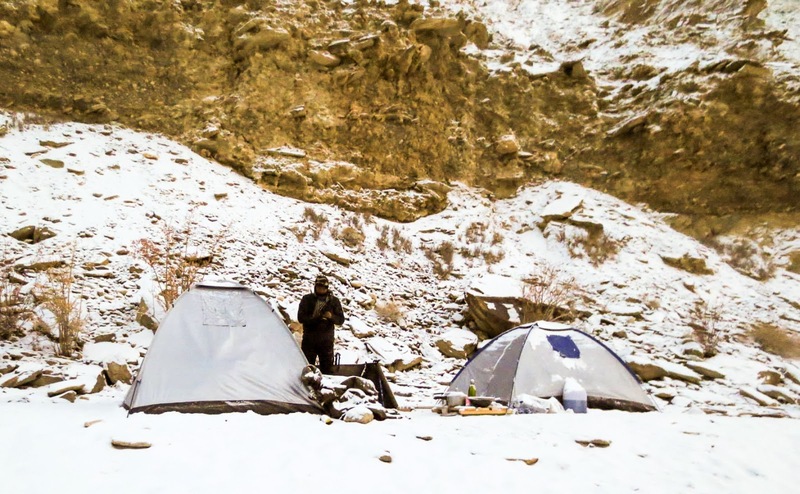 One day snowfall happened and all our tents were covered with white sheet and snow also entered into the tents. Finding right place for installing tents was one of the challenge. We used to find a sandy place to install tents which is near water source. 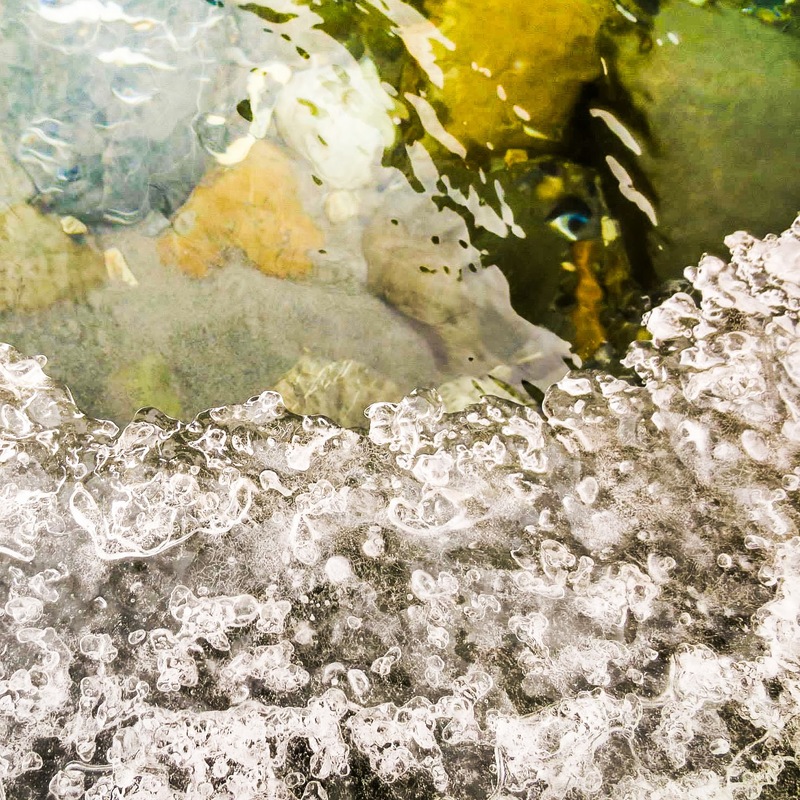 If not sand, at least, there should be stones to avoid the icy floor. After snowfall many of the groups got stuck.. Rains are also very risky. Whole trip went well for us and there were no hurdles by weather. This is just amazing, very adventurous.. I can imagine how the team must be feeling. Wow ! 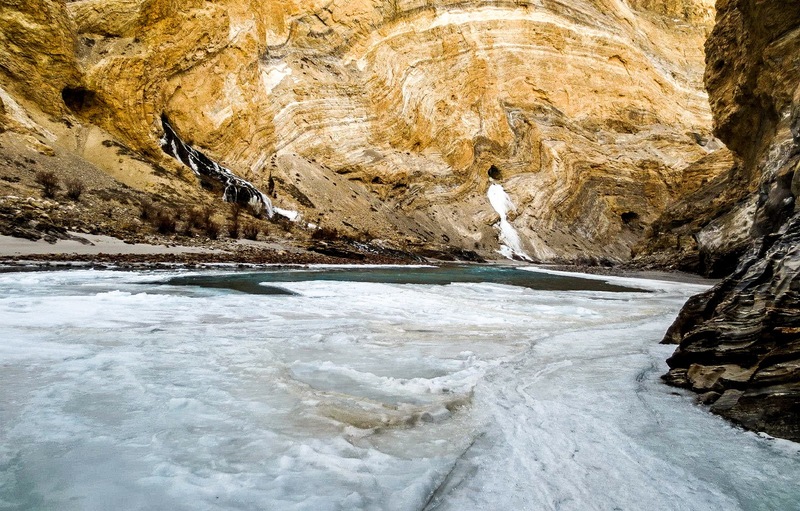 Beautiful photographs telling a great story of Chadar trek on frozen Zanksar River. Thanks for sharing Pramod. After knowing about the during of this trek, I was wondering about how the body would feel after spending 10 odd days in such a chill. Would love to hear back more details of this trek. wow :) Thanks for posting our pictures . It was unbelievable journey for us :) I will hit chadar trek next year again after completing roopkund and stock kangdi in coming months. 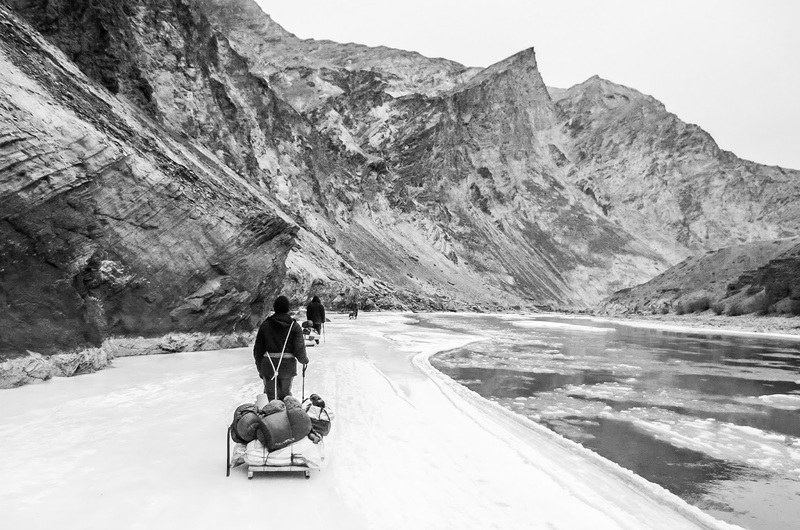 Wonderful account of the trek! We have just been in heaven that week. It was great time of our life what we spend there and hope soon have plan on bike in summer. 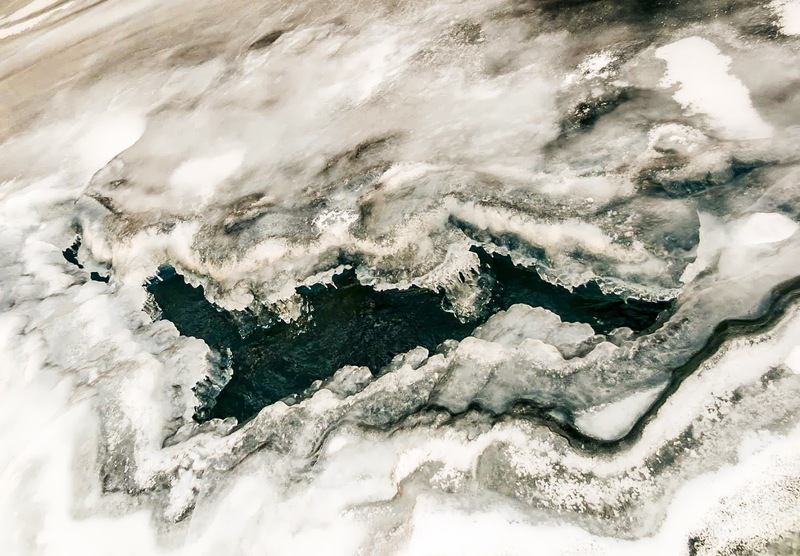 Its really hard to imagine nights on bank of frozen river in -30 degree temp. Here I like to thanks a ton the local guy who was collected wood for bone fire and cooked delicious food for us. We were 5 members in team Mr. Rajender, Mr. Prem, Mr Satyandra, Mr Chhabeg and myself Pramod. All are so excited in start and back with lots of good memories but tired. I can't forget Prem's short stories about Bandar(Monkey) and delicious chicken, Alloo Pyaz pakoda by Rajender. 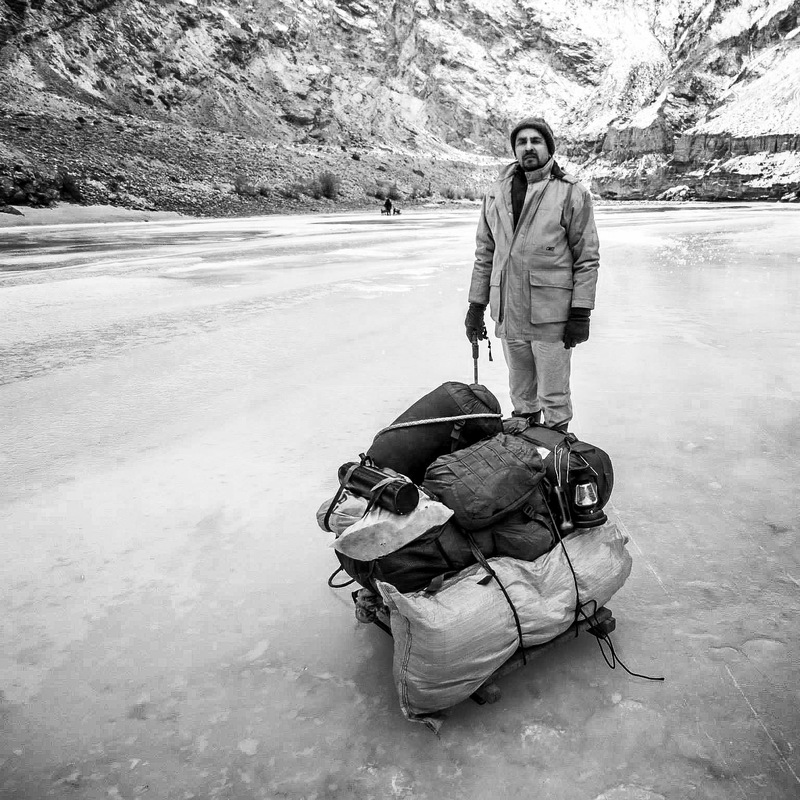 Rakesh has missed this trek due to his busy schedule at that time and Vivek was not able to catch his flight. It was awesome and never forgettable trek and hope we will join again in near future on another trek. Other friends who were with us on Triund Trek but not able to join us on this trek. Thanks again all guys making beautiful our journey. I must say looking at your pictures giving my goosebumps. ! !